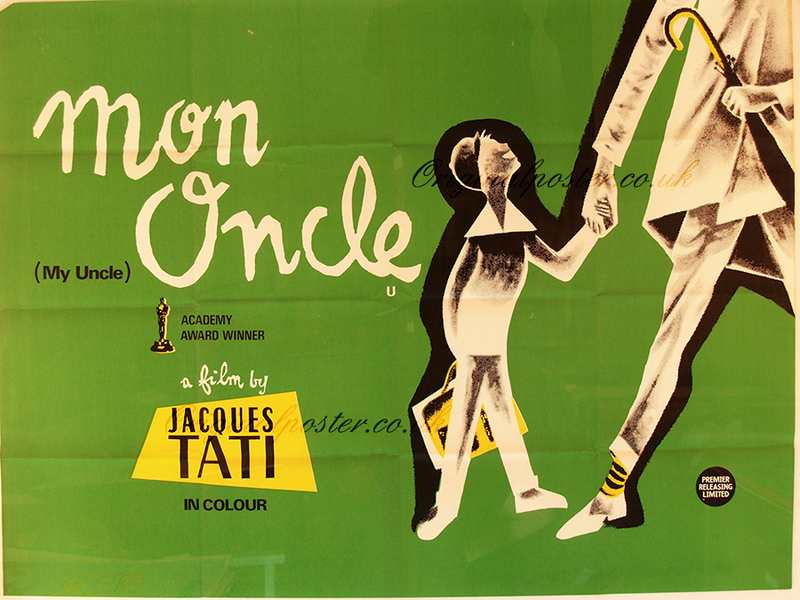 Mon Oncle (1958) – Movie Review – Another Movie Blog! Jacques Tati’s third film, Mon Oncle is also his first in colour, and so few directors made that transition better. This is an absolutely gorgeous film, with pop art colours cast against colder grey background, and the warm idyllic colours of ordinary French life all creating a perfectly realised world. It’s as rich as anything Hitchcock was doing during this period, and considering this came out the same year as Vertigo that is a big complement. It is also plays beautifully into the story of the film, one that sees the parents of the modern lifestyle loving Arpel family struggle with Mr Hulot, the titular uncle, as their Gerard is more taken with his simpler, less sterile way of life. Many critics of the time saw the social swipes at reactionary and a little luddite, but I don’t think Tati would work so often in these kinds of environments if he completely hated them. With him placing the credits of the movie inside the construction site, I think he sees himself as a kind of modern architect – with his next film that would literally be true – and he certainly gets a lot out of them. The jokes are more at the expense of class, of superiority and high society, and its in these places the film finds its funniest moments. The whole party scene in particular is a highlight, as well as Hulot’s incompetence around the kitchen. And that damn fish, only turned on as a status symbol (I also really like the running joke of Hulot getting blamed for the children’s actions). And, to paraphrase Buster Keaton, Tati does for sound what the silent comics did for slapstick, with the piling the buzzings on top of each other with precision timing, and the bright music, particularly at the end, knows how to sell a subtle gag. But even when not laughing, or chuckling, or amused, its hard not to be taken by just the sheer craft. The organised chaos going on in the frames, which ratchet up in intensity. The scenes framed from a distance over fences, demonstrating modern disconnect as well as directing our eyes towards the gags. And Mr Hulot’s own house, and the way the audience navigates it, is just a marvel. (The use of triadic/complementary colours, and the storybook frame of scenes, and the overall amusing tone of Mon Oncle must have influenced Wes Anderson in some manner). Sometimes I think a joke gets overplayed, like the contraptions of the modern house, and there’s more of a concrete judgement to characters’ actions than the rest of his filmography. But in era of assaulting comedies, Tati’s films feel like free leisurely worlds that we can play in. In Playtime he would take that idea to its peak, but as with all his films Mon Oncle is just delightful to roam around in. Oh, and there’s dogs. Lovely dogs. Can’t hate a movie with this many dogs.